Are you looking for unusual things to do in Paris? Is this perhaps a repeat visit to Paris and you have already seen the top tier most-visited touristy attractions? Or maybe you are simply yearning to visit unique Parisian spots maybe you are not aware of. Well, you have come to the right place! I have been to Paris several times and I love seeing the unique and unusual side of her. Paris, referred to as the City of Light, is one of the most beautiful and captivating of European capital cities. With a little research, you can dig into the heart of the city and find what the locals do and where they go to eat, drink and shop. 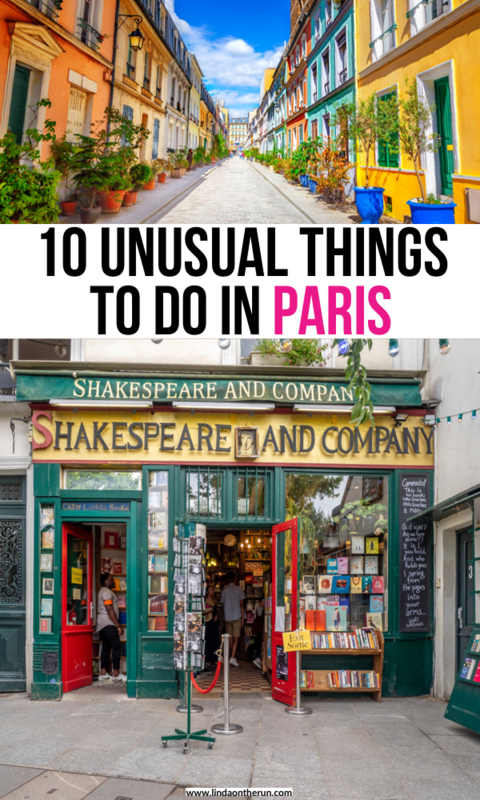 And that is exactly what I have done for you here: I have shared my favorite10 unusual things to do in Paris to tempt you to discover and explore Paris’ many, maybe not so well-known, locations. 7) Check Out Pigelle Basket Ball Court That Is Eye-Popping! Yes, that’s correct! There is actually a working vineyard in the heart of Paris. It is Vignes du Clos Montmartre, located in the 18th District of Paris, otherwise known as Montmartre. Perhaps visiting the bohemian and artsy neighborhood of Montmartre is already on your Parisian itinerary. Of course, you want to see the spectacular view of all of Paris from high atop the hill of Montmartre. And you do want to stop in the magnificent basilica of Sacre Coeur. Also, there are local artisans selling their wares galore, amidst so many restaurants and souvenir shops that will surely delight your senses. But not many know that located on Rue des Saules, on a very steep slope heading back down Montmartre Hill is a working winery!. 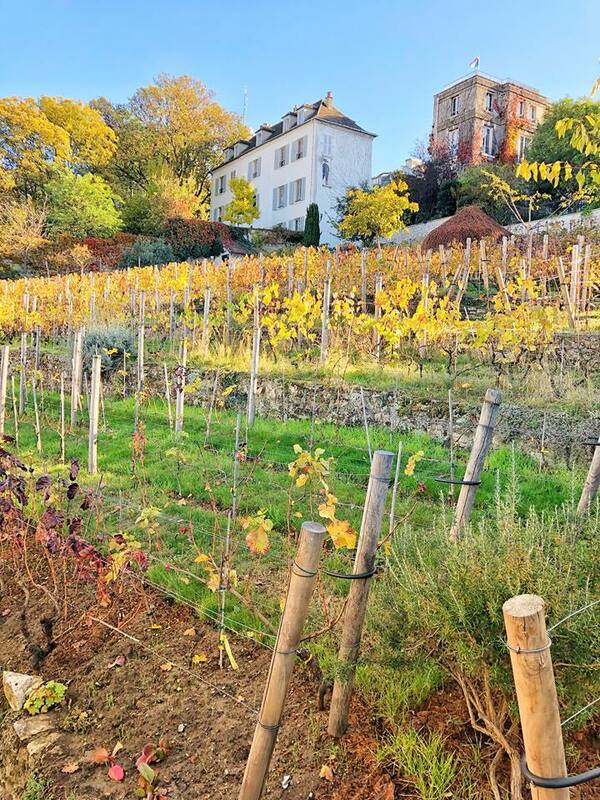 Visiting a winery is certainly one of the unusual things to do in Paris for sure. Many tourists are not even aware of Clos Montmartre so you will have an advantage over them. You can take a tour of Clos Montmartre, and it is best to purchase your tickets online beforehand. When I visited with my family, we simply strolled Rue des Saules and Rue Saint Vincent, the streets bordering the vineyard. The only working vineyard in Paris, Clos Montmartre on the sunny afternoon we visited. Located not far from the iconic Notre Dame, in Paris’ Latin Quarter, is a sweet (no pun intended!) cafe called Odette. You will not find the famous French macarons there, because the owner does not like them and wanted to do something a bit different with his establishment. What you will find is a charming, albeit small, quaint cafe filled with tempting pastries, most notably choux pastry, which translated into English means “cream puff.” They are light and airy and filled with flavorful creams of different flavors for you to choose from. Taking a moment out of a busy day in Paris to sit and sip coffee while eating a choux pastry at Odette’s is one of the more unusual things to do in Paris! 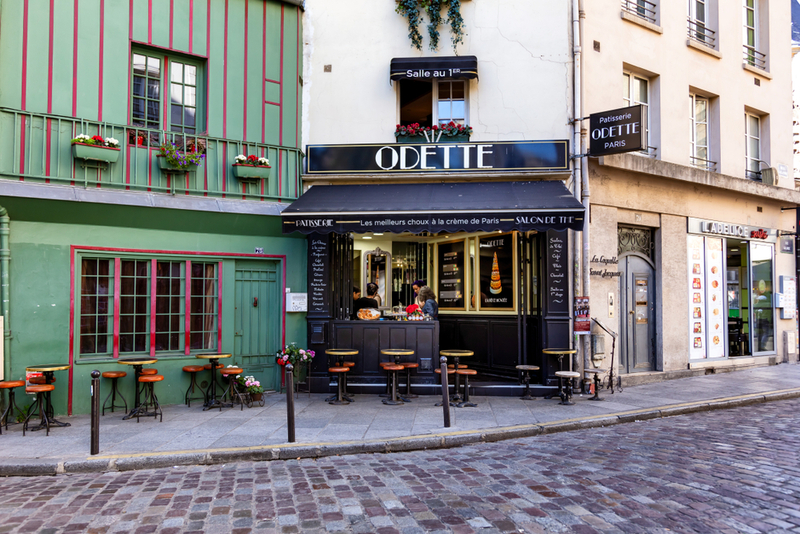 Odette is a lovely place to stop for French pastry during your visit to Paris. 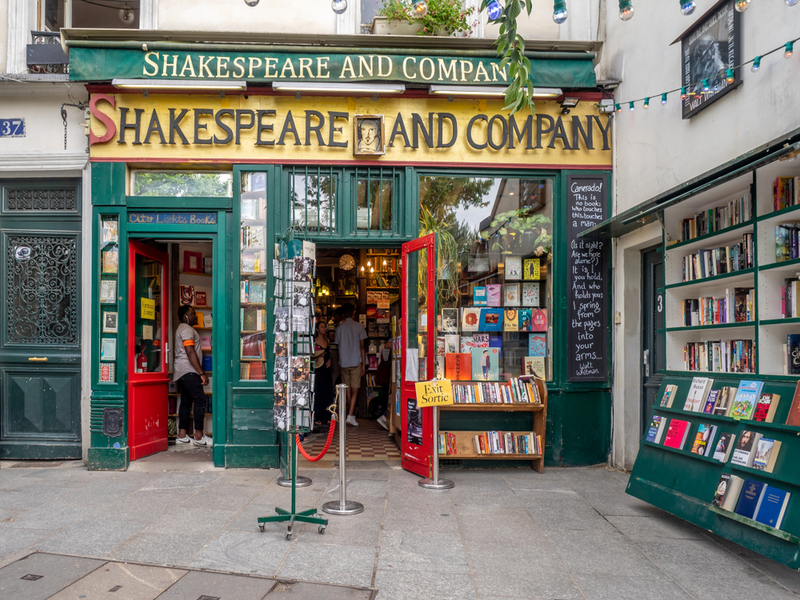 Literally located simply steps from Notre Dame Cathedral, Shakespeare and Company Bookstore is understandably a very busy place! Located in a refurbished building, (they kept to its period authenticity) there are loads books written in English to be found. If you only have time for a quick stop but find something intriguing, you can purchase it online at a later time. There are events and speakers scheduled at the bookstore so be sure to speak with an attendant to inquire what is going on when you visit. If you are looking for refreshments or a meal, you are in luck. Next to the bookstore, you will find Shakespeare & Company Cafe serving all things fresh and delicious, mostly organic and vegetarian. They have a great selection of muffins, donuts, and desserts if you are interested in only a quick fix as you go on about your day. It is easy to quickly walk by this establishment during your busy day in Paris, but worth a stop to slow down a bit and wander amid all the lovely books and perhaps have some coffee and refreshments. Visiting Shakespeare & Company Bookstore and Cafe is one of the intellectual and unusual things to do in Paris. A stop to browse in Shakespeare & Company Bookstore is one of the more unusual things to do in Paris. Coffee and pastry at the adjoining cafe would be lovely as well. One of the unusual things to do in Paris that many tourists do not know about, or take advantage of, is witnessing a gorgeous sunset from one of Paris’ rooftop bars. To gain unobstructed, almost 360-degree views, not much beats the rooftop terrace at Printemps Department Store. You can shop till you drop, then grab a glass of French wine or a cocktail and enjoy the sunset. Montmartre and the Sacre Coeur Basilica appears very very close, and in another direction, the Eiffel Tower off in the distance, silhouetted by the setting sun, is a memory not easily forgotten. Catching a sunset from Printemps is one of the many unusual things to do in Paris. 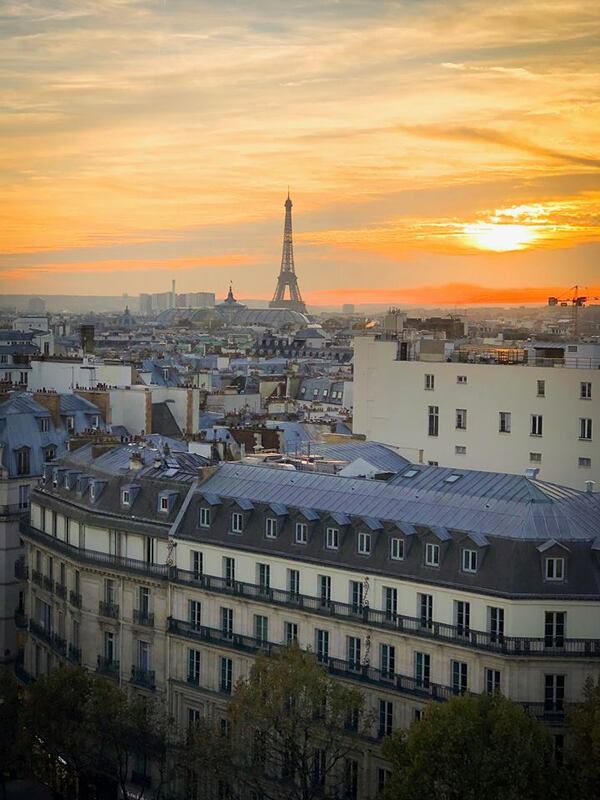 This beautiful Parisian sunset shot was taken on my last trip to Paris from the Printemps rooftop. Rue Cler is Paris’s most famous street market. 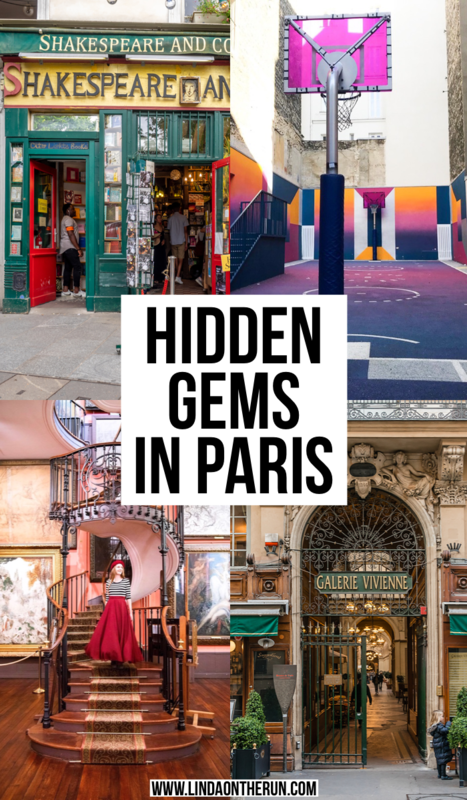 It is located in the 7th arrondissement and is almost nirvana to explore. The entire street is mainly pedestrian-oriented with its original cobblestones. And this is where the Paris locals do their daily shopping. And while the Rue Cler is busy and bustling, it is not overrun by loads of tourists which makes this one of the more unusual things to do in Paris. You will find bakeries, florists, ice cream and gelato shops. There are several grocery stores to stock up with supplies if you happen to be staying at an Air BnB, or simply want some snacks to tuck into your backpack. There are coffee shops, pastry shops and of course, lots of restaurants and cafes to select from. Of course, I think the most fun of all is having a glass of wine, a coffee, or a bite to eat and sit outside at one of the outdoor cafes and watch the world go by! The charming rue Cler where you can wander the cobblestone street, shop, eat and drink as the locals do! You do not have to be an Instagrammer to want to have pretty pictures as memories of your trip to Paris. And there is no better location to head to than Rue Cremieux for such photos. Located in the 12th arrondissement, Rue Cremieux is just about one block long and full of charm and whimsy. The houses are small and painted in luscious pastel colors. Depending on the season, you can find flowers blooming in the window boxes below their front windows or on their front stoops. The entire block is pedestrian friendly and still retains its original cobblestoned street. All this being said, there are people who disrespect the owners’ properties and more importantly their privacy. So if you do decide to seek out Rue Cremieux for some memorable snaps, do not walk on the owners’ steps or porch. And golly, don’t look into their windows! This happens all too frequently and makes it a burden for those who call Rue Cremieux their home. 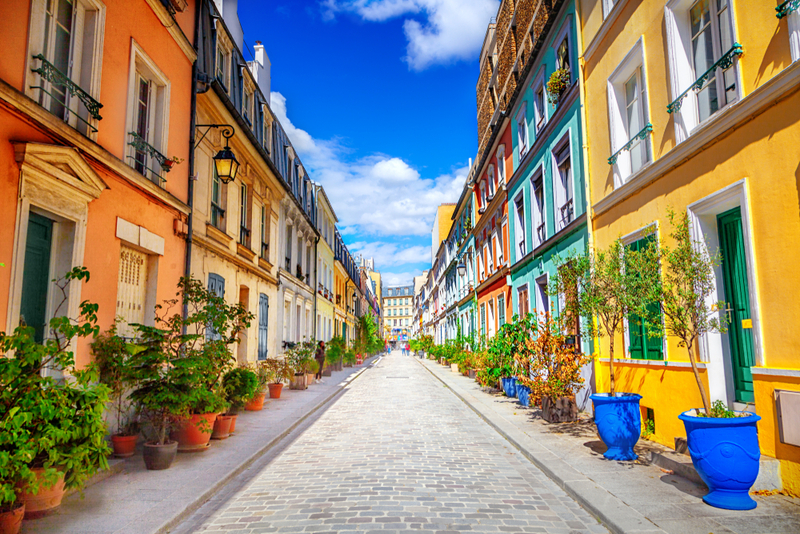 Seeking our rue Cremieux is one of the more unusual things to do in Paris. Please be respectful. If you are a sports’ fan, especially basketball, or have one traveling with you, this unusual things to do in Paris destination is a must visit. Or in this particular case, a must see! If you are an artist who does not much care for any sports, especially basketball, this is still a must-see for you as well. 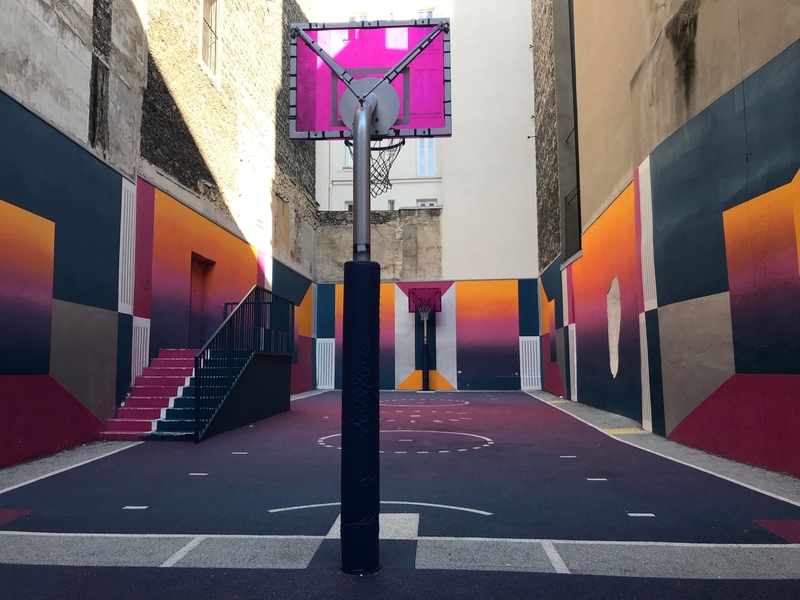 Located on Rue Duperre, in Paris’ 9th arrondissement, the Pigalle basketball court is sandwiched in between historic residential buildings on nothing more than a sliver of property. Painted in nothing less than eclectic pinks and blues, it is eye-popping for sure. The idea behind this in the first place was to make the basketball court appealing to the local kids who live in the area. Enter several high-profile companies to bring that thought to fruition and wow the results are visually stunning. Not sure what I mean by “covered passages?” Back in the 1800s, they were fashionable shopping arcades and were extremely popular. However, over the years they almost disappeared. It is wonderful that the most charming and exquisite of these old-time arcades are still around and waiting for you to explore them. The first time I visited Paris I did not even know they existed. I do not want you to travel to Paris and not be aware of such a very cool option to explore. Today the covered passages are meccas of restaurants and cafes, independent shops, pastry shops, bookstores, and antique shops. What is so cool is the all old world architecture from the 1800s still visible in the remaining covered passages. It is literally like stepping back in time. 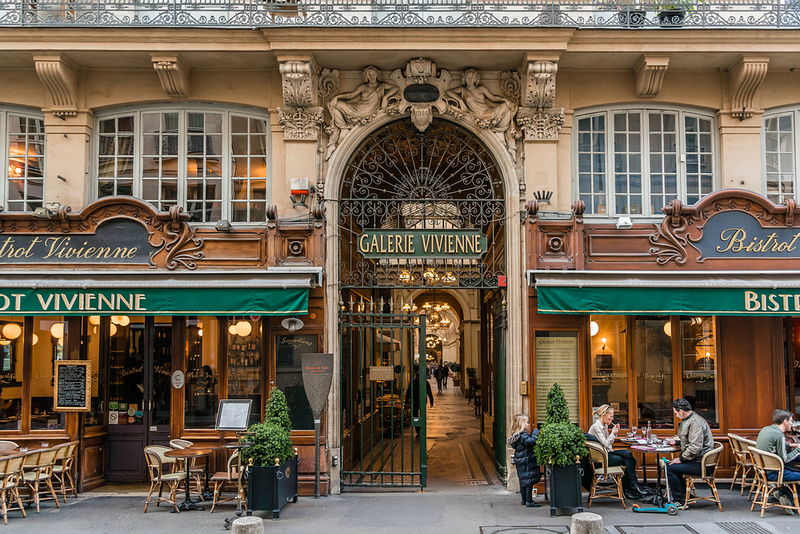 One of the truly unusual things to do in Paris is visiting the nostalgic covered passages. 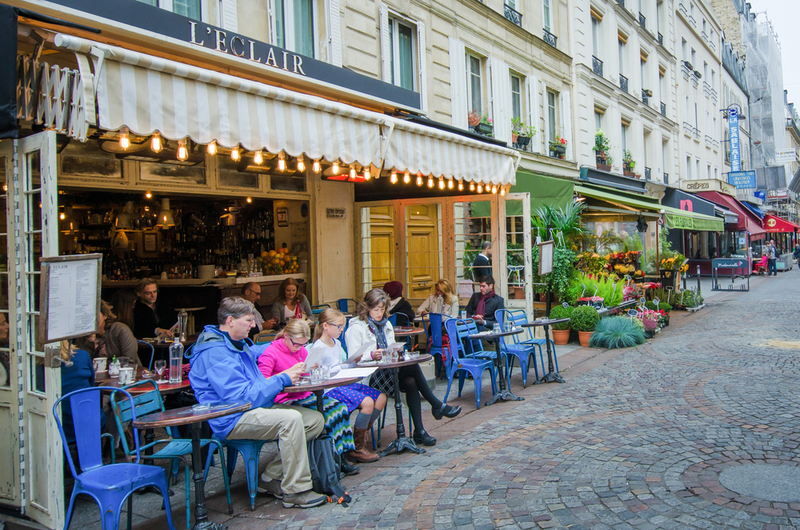 Check out this link for The Top Ten Covered Passages In Paris And How To Find Them. Even if you only have a short visit to Paris planned, this will help you decide which covered passage to visit, and where to go to find it. 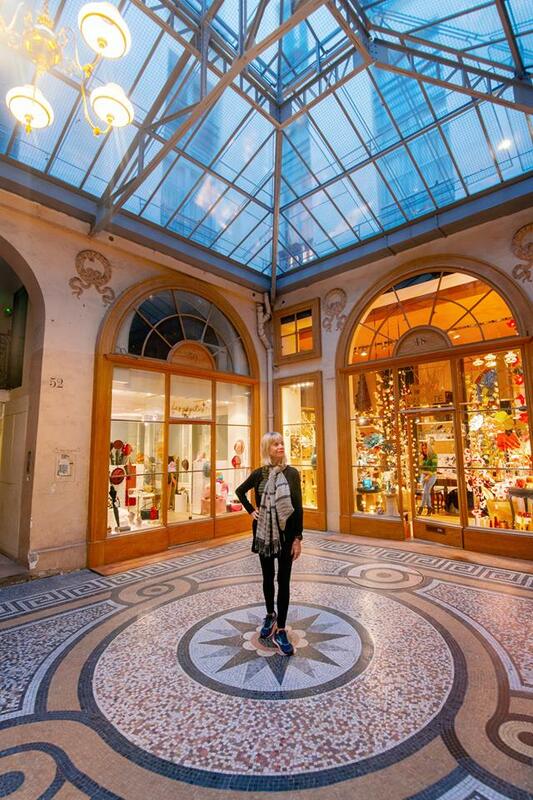 Here I am looking at all the lovely architectural features in one of Paris’ hidden passages: Gallery Vivienne. Gustave Moreau lived in Paris in the 1800s. He was a “symbolist” painter. At the museum honoring him, you will see three stories full of his works. There are literally thousands of his paintings, watercolor drawings and pastel sketches to view. Located in the 9th arrondissement, you will find that this museum is kind of off the beaten path, and a bit less crowded and touristy. Along with all of his works prominently displayed, you will be able to explore the living quarters where he and his family actually lived. The architecture is glorious, and there is a grand circular staircase that will lead you from the second to the third floor, that could be the backdrop for a wonderful and memorable picture of your Parisian visit. 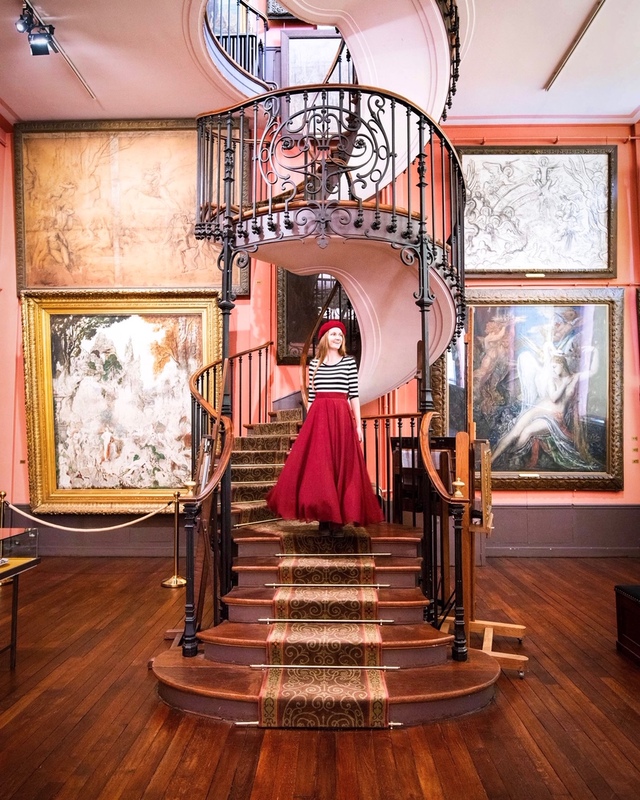 My daughter Victoria poses on the ornate staircase at the Gustave Moreau Museum in Paris. Yes, you read that right. Instead of taking a bus, or mass transit, or a taxi to get around Paris, give riding an e-scooter a try. During our last trip to Paris, we noticed clumps of lime green scooters everywhere. It was as if they were left randomly. And they were. When you are finished using your scooter, you simply leave it at your destination. The only caveat is: do not leave your scooter in the pedestrian walkway or in the street, both of which make good sense! Download the phone application of the scooter company (we used Lime) and input your credit card information. Once you have established an account, you can see where available scooters are in your vicinity, due to the GPS capabilities of each individual scooter. You can rent a scooter for as long as you think you will need one. when you have arrived at your destination, you verify through the app on your phone that your are done, and simply leave the scooter and walk away. More likely than not, there will be someone who will scoop it up and be on their way very soon. Touring Paris by scooter is definitely one of the more unusual things to do in Paris. 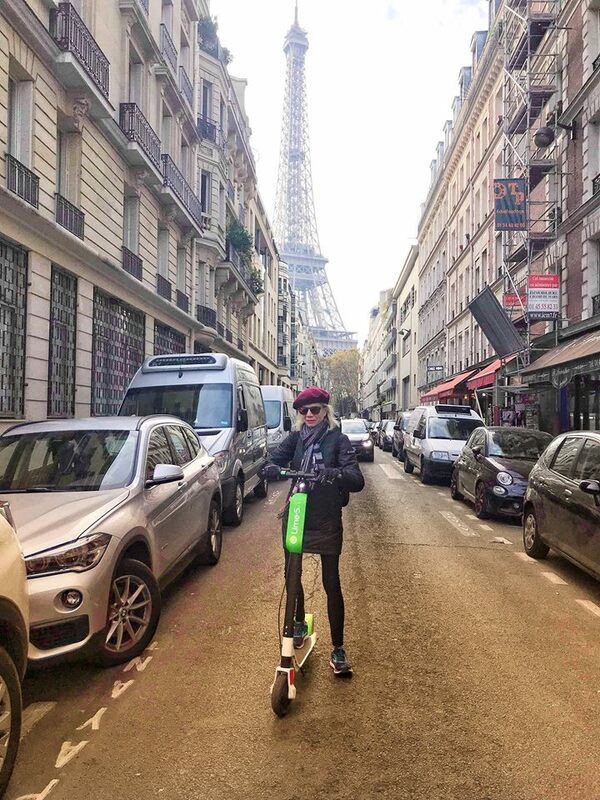 Here I am negotiating a side street in Paris using a Lime e-scooter. They are very easy to use and a fun way to get around Paris! I have shared with you ten of the most unusual things to do in Paris. Things and places that I have personally enjoyed doing and visiting. Have you ever been to Paris? Did you visit any of these places I enjoyed so much? Do you have any other unusual things to do in Paris to add to my list? Please leave in the comments section below! Thank you. Merci.